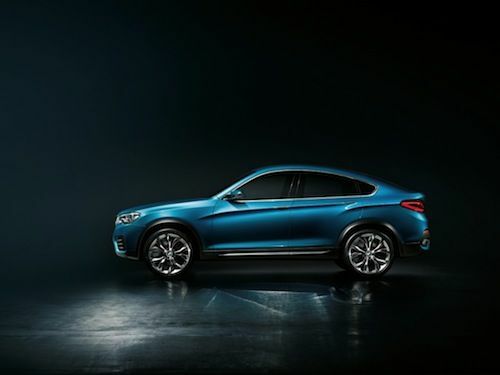 The new BMW X4 Concept is making its ground breaking world premiere at the Auto Shanghai 2013 and will be the forerunner of a new 2015 X4 production coupe. BMW has always been a leader in developing new vehicles that have defined a new vehicle segment. The BMW X models gave us the Sports Activity Vehicle segment with the X6, X5, X3 and X1 that continue to define the segment today. But there was a number missing in the lineup until today when BMW unveiled the new BMW X4 Concept vehicle that will further define the X line-up into a new segment. The BMW Concept X4 is making its global premiere at the Auto Shanghai 2013 and will give us a glimpse at the future direction of the BMW X family. Why did the brand create a new BMW Coupe out of the X line? This segment is a popular model for BMW and its no wonder why they wanted to further expand the X range. Since the introduction of the first Sports Activity Coupe, the BMW X6 in 2008, the X range has been successful for the German automaker. Since the first BMW SAV took to the stage, average sales across the BMW X line-up have progressed on a constant upward curve: 25 percent of BMW cars is now a BMW SAV. That’s a good reason for BMW to carry the attributes of a Sports Activity Coupe into a further vehicle segment. Will BMW actually turn the Concept X4 into a production model? The BMW Concept X4 is more than just a concept vehicle being rolled out in Shanghai. BMW will launch the new BMW X4 production model next year. The company has already developed the new X4 Coupe and is getting ready to roll it into production which is scheduled for 2014. BMW has already made plans to build the new X4 Coupe at BMW Plant Spartanburg in the US. The competence center for BMW SAVs also produces the BMW X5, BMW X6 and BMW X3. At first glance the new BMW Concept X4 catches the eye with its quality of a BMW X model that have been blended with the genes of a BMW Coupe. The large 21-inch bi-color light alloy wheels give the coupe a striking appearance when viewed from the side. BMW is definitely appealing to the emotional senses with its new design and should be as successful as the previous X model range. And it would hold the promise of out-standing BMW performance and driving dynamics that buyers have been accustomed to. BMW has not released performance details or what we can expect to be under the hood of the new X4 Coupe production model. For now, we can clearly see that the new coupe combines the rugged looks of a BMW X model with the emotional and sporting aura of one of the brand’s Coupes. The Concept X4 will be the forerunner of a new segment for the brand. The BMW Concept X4 brings a new sporting a product character all its own. As such it follows in the tracks of the BMW X5, BMW X3, BMW X1 and BMW X6, which likewise adopted the role of trailblazer in their respective segments and continue to set their class standard today. Look for the new 2015 BMW X4 to make its world debut sometime next year. Wow a cross between an SUV and a sedan. It's almost like a cross...over. BMW really pushes the boundaries of car design.